A change in the leadership of the Caribbean Court of Justice took place earlier today during a ceremony which paved the way for a three-day meeting of CARICOM heads. The event, which was prior to the meeting of the Heads, was addressed by Prime Minister Dean Barrow, representing one of four countries that has the C.C.J. as its final appellate court. Justice Adrian Saunders was conferred with the presidency of the C.C.J., succeeding Sir Dennis Byron to become the third president of the judicial institution of the Caribbean Community. Saunders has been a judge at the C.C.J. since 2005 and has contributed immensely to the administration and judicial functions of the court. 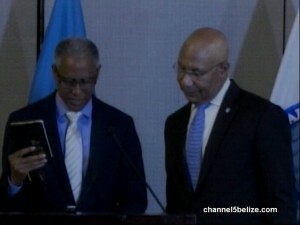 Before an audience of his peers and various CARICOM heads of government, President Saunders was administered the oath of office.